November 25th is coming. Wait, isn't Thanksgiving on November 24th? Yes you are absolutely right, but the 25th is what many people are waiting for. This is not only the day after Thanksgiving, but it's Black Friday, and the premiere of Netflix's brand new Gilmore girls: A Year in the Life! It's really the perfect time to get up early, do your Black Friday shopping, and spend the rest of the afternoon on the couch binging on leftovers and Gilmore girls with your family. But how do you successfully pull this off? I'm glad you asked. Here is my list (with a little help from the show) so you can get yourself mentally prepared. 1. Make sure you have plenty of caffeine. Let's face it, you've been up since the wee hours of the morning and have been gorging on turkey and gravy for 48 hours straight. You are going need to make sure you have plenty of caffeinated beverages on hand. Assuming Luke's Diner isn't next door, you will need to get serious about your coffee if you're going to do this binge right. 2. Remember to have patience with your family. Your family will be recovering from the same sleep deprived cranberry sauce induced coma as you are. You all need to have extra patience with each other. 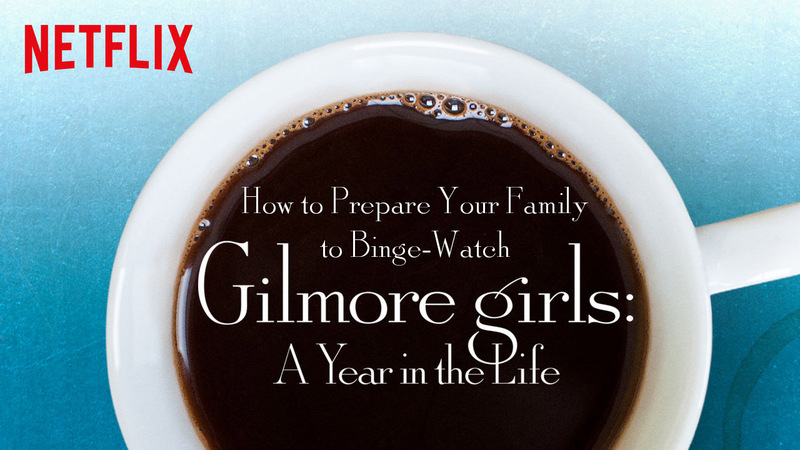 This is especially true if one of your children is too young to appreciate the phenomenon that is the Gilmore girls. It is also true if your spouse is trying to get into it, but doesn't know the entire backstory. Although in the latter case, it is permissible to banish them into the other room to watch previous episodes and stop bothering you. 3. Cut down on surprise distractions. You're gonna need to set the ground rules in advance. Let's face it, no one likes unexpected visitors or distractions during a marathon of your favorite show. Precautions are necessary. Work with your kids to black out your front windows and front door. This way, if an unexpected guest comes, it's easy to pretend that no one is home. Cell phones also should be put on silent. Texting your family from the other couch is ok, but anything that will break everyone's focus is outlawed. 4. Don't let anyone convince you that your plan is crazy. There will always be people who try to let negativity and pessimism ruin their lives and yours. This could be a friend earlier in the week, or your kid when you are halfway through your binge. You must stay strong and stick to the plan. It's a marathon, not a sprint. Remember when Rory quit Yale? It wasn't pretty and she eventually went back. Don't make the same mistake. 5. The right clothing is essential. I'm just warning you now, if you don't prepare the right clothing, you will fail. Chances are you probably still have elastic pants on from Thanksgiving. That's a good start because comfort beats style every time. Except if you are dressing in a plaid shirt and a backwards hat. Although that could realistically fulfill both purposes. 6. Don't forget to write down your favorite signature quotes. You're going to need those signature quotes the following week. Rest assured, there will be a moment that requires that perfect quote from the show, and you don't want to be the person that's not ready to recite it. If the people around you don't understand the quote, that's on them for not having the commitment to binge-watch the show. 7. Last, but not least, celebration is in order. When the last episode rolls credits, it's time to celebrate. This is an achievement that deserves at least a few moments of glory. The most fulfilling thing to do is to let the world know about your accomplishment. Updating your status on social media is not an option, it's a necessity. There will be those who are envious, but your feed will mainly be filled with those who admire your devotion. I hope that this guide has been helpful for you and your family. In case you need to raise your level of excitement, rewatch the trailer for the new Gilmore girls season below!